Below we will be discussing how to earn and get backlinks from social media sharing users and websites that includes everything from being the first person to comment and how to comment so that you get response and more plus one and Facebook likes. I will also share some live screenshot that really helped me how popular websites gets natural links from users and how they engage the audience. Here we have blogging tips for both dumb and pro bloggers. So enjoy the reading. (1) Interact early and often. Well if you really want to earn links always try to be the first person to comment not only on the blog posts but on all social media that a website uses because editors most closely looks to few first comments and if you do this then you are on the radar of editors. It is a great way to come into the eyes of editors of popular websites but do you really know how to comment. Well if not read below. 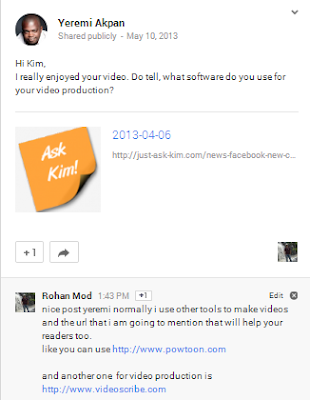 As you can see I was the first one to comment on his post that he shared and I added 2 more resources in the comments and most likely when people will see his post they are more likely to see my comment and this way my profile gets more exposure and the result will be more plus one, traffic and links. I have another example in point no. 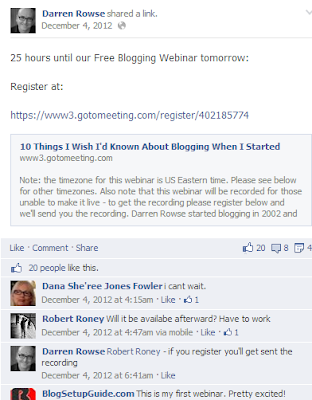 3 where someone commented on the Darren Rowse Facebook page and he was the first person to comment and in response Darren solved his query. So to know what happened later read below. (2) Always add value to the conversation. Well always try to add value to the conversation. But be alert do you use such lines?" hey great post, I like it very much and thanks for sharing" come on does it strike you. No way it does not strike me and it is not mentioned as adding value to the content. Apart from this try to add more flavors to the content like you may have seen another great post similarly to the current post that you are reading. Add some new points that editors did not mention, Tell them about some videos which represents more information or add some more user friendly graphical content to that post and it is easy when you are working in social media that will strike the author and also the upcoming readers and chances are higher to earn links not only from the editor's website but also from other readers . 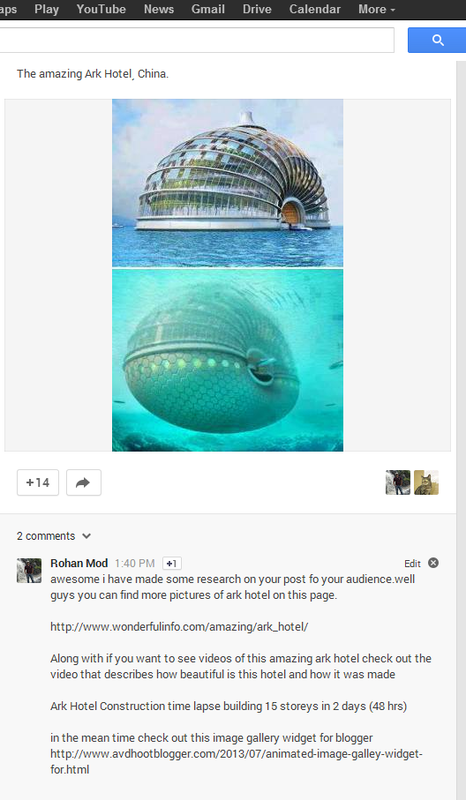 For example see the above images the lady shared a few pics of ark hotel china and the commentator added more information to his post. 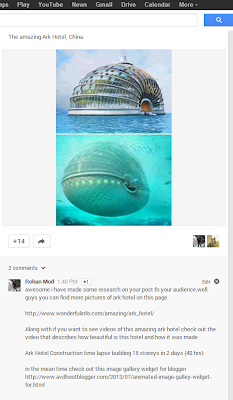 He has added the URL of a website which has more photos of ark hotel and along with shared the video too. So this type of comment really strikes the editors and in response that comment is really going to get more plus one and more clicks on his profile. 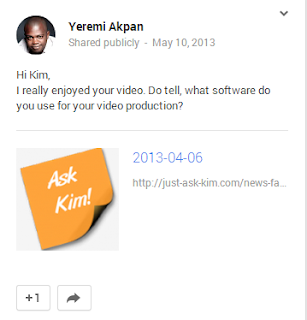 (3) Ask questions, offer to help on Facebook pages, blog posts, YouTube and more. Well you are now on the radar then offering to help, now what is the mean by help? As I explained in previous point that do some research about content and add all related information on their Facebook pages, Google plus pages and other social media sharing pages and this way you really add value to the content. Well this strategy really works and puts you on the radar of editors. And they are most likely to give you backlinks. If you follow this blogging tips it may work for you too. 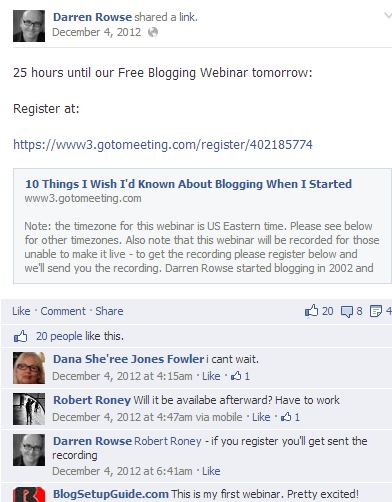 As you can see Darren responded to the first comment and you also know why. He asked a favorable question that relates to his post and you know the fact that later Darren also mentioned him in his post and he got a backlink from Problogger. So a little but honestly comment can give you backlinks. So if you follow this blogging tips to get backlinks from social media it will really help you. (4) Promote Others To Get Promoted. As you can see Yeremi is not sharing his post but he is sharing one of his friend's post that he liked. Closely read his promotion strategy because it is giving the impression to his readers that he really liked the post and because of this all of his followers are going to make some clicks on the post that he shared. Along with that blogger will be too happy because his post is being shared and in response he may give backlink to Yeremi. So there are various small small things that may work for you. If you seriously follow above blogging tips then that may really help you in terms of backlinks, traffic and healthy relationship with fellow bloggers and all are good for the growth of a blog. 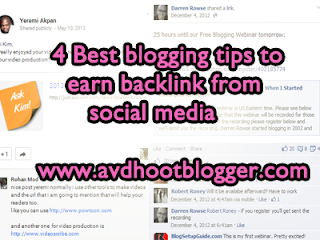 So if you like this 4 blogging tips to earn and get backlinks from social media sharing websites like Google plus and Facebook then please comment me and oblige me. Thanks for spending your precious time here.